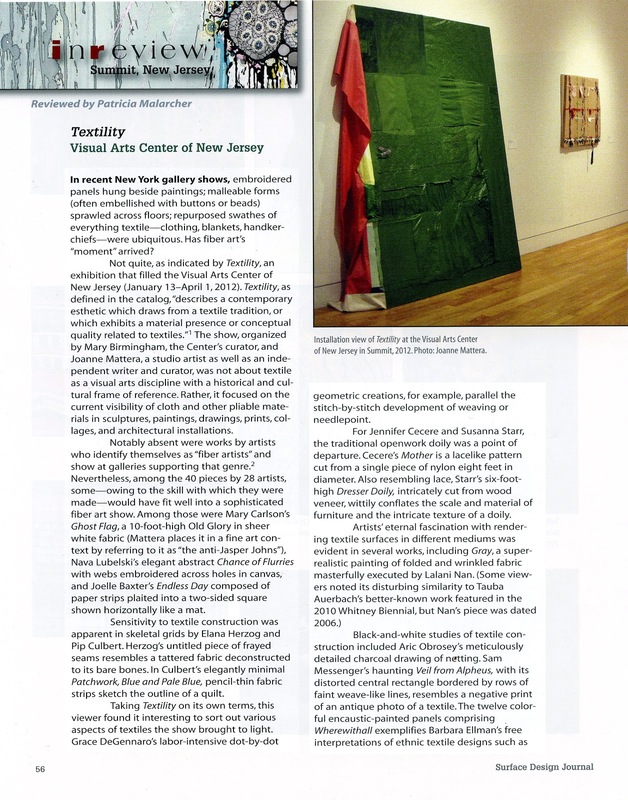 Textility, the painting and sculpture show I curated with Mary Birmingham at the New Jersey Center for Visual Arts in Summit, where Birmingham is curator, is long over (January 13-April 1, 2012), but a review has just come out in the Fall issue of Surface Design Journal. "The show . . . was not about textile as a visual arts discipline with a historical and cultural frame of reference. 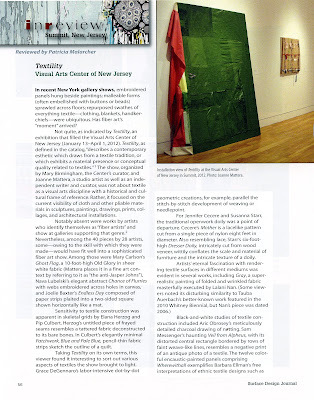 Rather, it focused on the current visibility of cloth and other pliable materials in sculptures, paintings, drawings, prints, collages and architectural installations," writes Patricia Malarcher, a studio artist who is former editor of the magazine and now a contributor to it. If she was disappointed she did not let on. She considered the exhibition "on its own terms" and went on to write appreciatively of about 15 artists in the 28-artist exhibition, and to show two works specifically as well as a panorama. If you click on the individual pages above and below, they will enlarge for legibility. But let me close with Malarcher's closing words: "Textility was a fascinating and ambitious, provocative show. 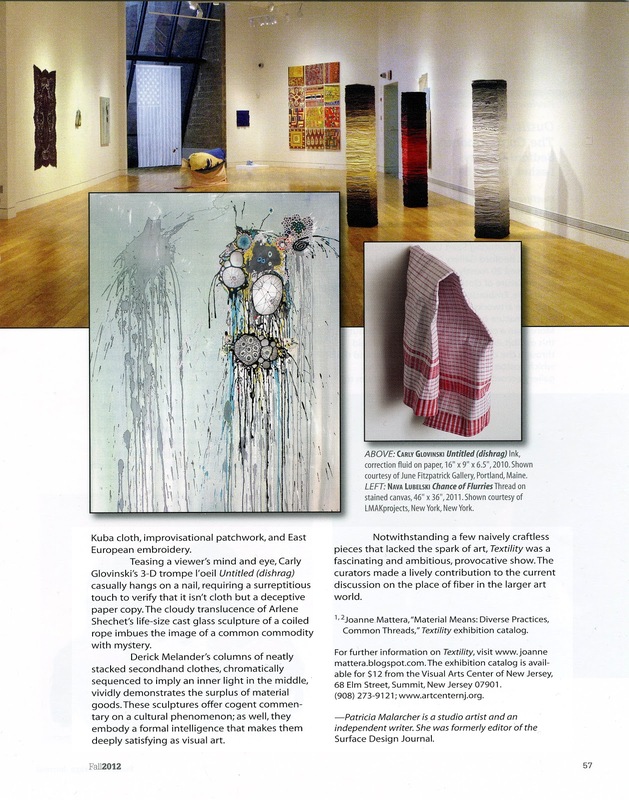 The curators made a lively contribution to the current discussion on the place of fiber in the larger art world." I loved this show (went three times when it was up.) It was exactly what I want shows to be: beautiful and thought-provoking. Best of all, I discovered the work of some new-to-me artists. Thank you. It was a privilege to work with a curator of Mary Birmingham's caliber and to be able to include work by such accomplished artists. So glad to see this picked up by SDA. Although I wasn't able to go visit in person (damn,) I've visited via the sidebar links at least three times since you posted about it, Ms. M.
Really loved it and the depth/breadth that you 2 ladies brought to it via your curating. I even loved the title of the show! Thanks for the heads up about the article and congrats again.